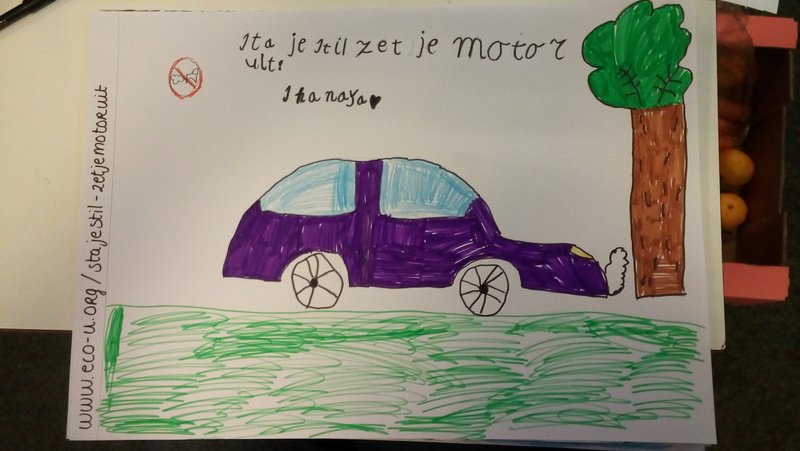 Our campaign, ‘Sta je stil, zet je motor uit’ or ‘Let it be, idle-free’, has been raising a lot of questions over the last months. Many people see the horrendous clouds of dirt coming out of cars when waiting for traffic lights and in front of schools. 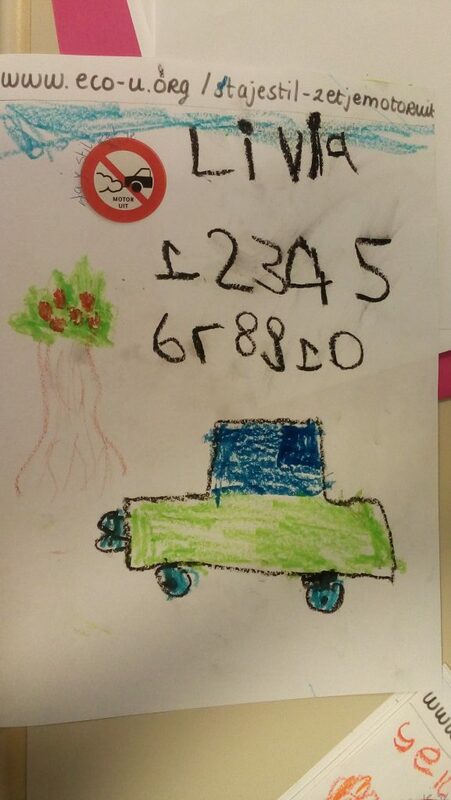 When you talk about this subject, a lot of adults do not even know how bad the situation is when idling a car. And not just for the environment, also for our health, the health of the kids and even your car itself receives damage from it. In this link you can read a little bit more about this, and here is a Dutch and longer version about it. 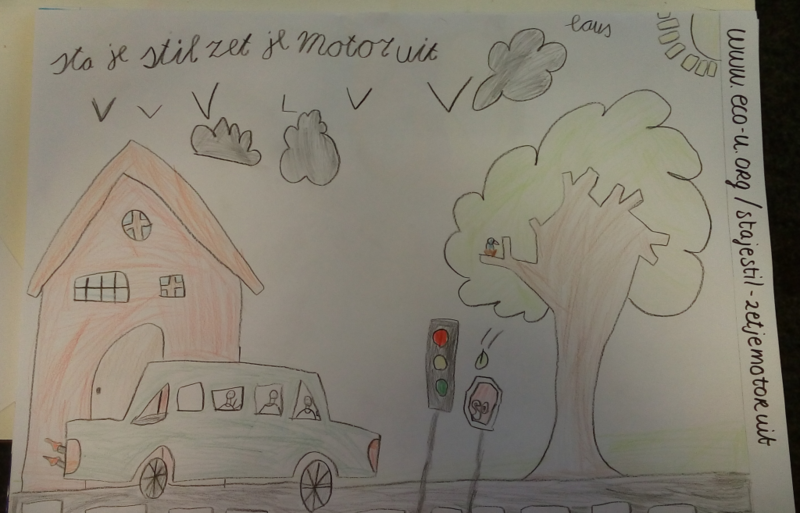 Although the grown-ups may be surprised by the effects of idling, kids are not. If you listen carefully they observe quite well that this can not be healthy for them, for the trees and plants ánd for the car. Because like we explain to them, it is like a kid that needs to sit still while it wants to run around: it puts pressure on the body. We, at Eco-u, take much care to not tell them how they need to see it, or think about it. We tell them a situation in a very objective manner and try to figure out how we can better it, all together when bundling our powers. Better it? Yes of course, because the facts and science tell us this is not healthy in any way. And we would like to see our kids healthy, right? But what can you do, except ofcourse turning off that engine when waiting longer than 10 seconds! As a parent, teacher, organisation or even neighbour you can pick this campaign up and colour for a brighter future. Children love to draw, and next to that they love to have a voice in this world. Sharing their feelings and thoughts is one of the things that need to be done more. So pick up a crayon or pencil and make posters, pamphlets or even artworks. You can, of course, use this as a reference or create one of your own.